Overall, users find the solution intuitive and easy to use, fast to deploy, and able to effectively meet diverse organization and process requirements. AuditBoard, the leading enterprise audit and compliance software provider, today announced it has won the GRC Innovation Award in Best User Experience for Integrated Risk and Control. 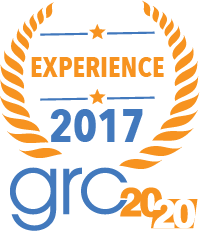 AuditBoard accepted the award from GRC 20/20, a governance, risk, and compliance software research firm run by former Forrester analyst, Michael Rasmussen. AuditBoard’s fully integrated GRC platform houses purpose-built solutions that address SOX compliance, IT and controls compliance, operational audits, and enterprise risk management, all united by a powerful, intuitive workflow. In vetting AuditBoard’s platform for the award, Rasmussen interviewed clients who collectively spoke to AuditBoard’s intuitive user experience in helping them deliver significant value to their organizations. View and download the GRC 20/20 report. AuditBoard is a SaaS technology company revolutionizing enterprise audit and compliance software. With AuditBoard, enterprises can collaborate, manage, analyze and report on critical internal controls data in real time. We offer a full suite of easy-to-use audit management and compliance solutions for SOX, controls management, operational audits, ERM and workflow management. AuditBoard’s clients include industry-leading pre-IPO to Fortune 50 companies looking to streamline their accounting and audit functions. Learn more at http://www.auditboard.com.